Johannes Stötter is a fine art body painter who creates incredible illusions with his paints and his performers, transforming human bodies into various animals. 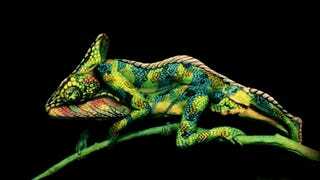 This chameleon is particularly spectacular, with two women forming different halves of the chameleon's body. The video below is slightly NSFW since the performers fully undo the illusion at the very end of the video, but it's remarkable to see how something as simple as the movement of the head and the shoulders can bring this faux lizard to life. You can see more of Stötter's work (and purchase prints) at his website.